Beloved physician and public servant. He practiced in Fort Wayne for nearly 40 years, first in his own surgery practice from 1964 to 1994, then, moving to occupational medicine with local companies such as Magnavox and the Parkview Occupational Health Clinic. Dr. Towles led the surgery team that successfully operated on civil rights leader, Vernon Jordan, after he was shot in the back and critically wounded by a sniper in the parking lot of the Fort Wayne Marriott Hotel, May 29, 1980. He was also a leader of the Fort Wayne African-American community and served as the President of the Board of the Fort Wayne Community Schools. Towles Intermediate School is named for Dr. Jeff H. Towles, who served on the Board of School Trustees from 1981 to 1988, a time when the district was heavily involved in desegregation. Dr. Towles was elected president of the School Board in 1987. He was passionate about providing a quality education to all students and helped lay the groundwork for the racial balance plan FWCS eventually adopted. Dr. Towles also served as a well-liked physician in the city. As a surgeon, he helped save the life of civil rights leader Vernon Jordan, who was shot and critically wounded while visiting Fort Wayne in 1980. Towles School opened in 2006 as a first through eighth grade Montessori school. Prior to opening as an intermediate school, the building housed Geyer Middle School, which was named for Ben F. Geyer, a longtime School Board member. The school was built as a middle school in 1959 in the midst of a building boom for the school district. The English Language Learners (ELL) program is also offered at Towles. As a Montessori school, the curriculum follows the methods developed by Maria Montessori, who believed children must cultivate their own natural desire to learn to become truly educated individuals who are motivated from within by a natural curiosity and love for knowledge. Classrooms are multi-age and look different than traditional classrooms. Materials are at the child's level and offer a hands-on experience. Students are shown lessons and then work at their own pace. Towles was the first public school with a first- through eighth-grade Montessori program in Indiana. Beginning in the 2013-14 school year, Towles seventh and eighth grades became Towles New Tech. New Tech encourages students to learn through a collaboration of project-based challenges and through connections with family, business and the community. Students work both independently and in groups on real-world assignments and projects that incorporate the state academic standards in ways that will prepare them for life after high school. Students use computers and other technology daily as tools to foster ideas, innovation and advancement. Students develop the resiliency necessary to succeed in a rapidly changing world and meet the high standards of universities and ultimately, the workplace. Grades 1-6 continue to follow the Montessori curriculum. As one of the districts seven magnet schools, Towles does not have a geographical area for its attendance. Students attending Towles came from Bunche Early Childhood Center and feed into New Tech Academy at Wayne High School. The school is located in the Board of School Trustees District 5. Trauma surgeon Jeff Towles usually hums while he operates. It helps to reduce the tension. But early on May 29, in OR No. 9 at Parkview Memorial Hospital in Fort Wayne, Ind., Towles was in no mood for music. At 2:05 a.m. a .30-06 caliber bullet from a hunting rifle had ripped a fist-sized hole in the mid back of a man in a local motel parking lot. Towles was sleeping in his one-bedroom apartment when the telephone jolted him awake. You better get over here, said a black physician. Vernon Jordan has been shot. Towles sped three miles to Parkview, where the president of the National Urban League had been X-rayed and hooked up to an IV unit. It was the biggest gunshot wound I'd ever seen, and I've seen plenty, marvels Towles, 51. It was a miracle that the shot missed the spinal column. If it was one or two centimeters to the right it would have hit the aorta, and that would have been devastating. Even so, Jordan needed seven pints of blood. Towles presided over a three-man surgical team that worked four hours, first controlling the critical abdominal bleeding, then cutting away damaged areas of the intestines and removing three large fragments of the slug. Some pieces were left in the thigh and chest, since they were not near a nerve or critical blood vessel. The wound will heal itself with antibiotics. During surgery, maintaining Jordan's blood pressure while he was anesthesized was a crucial problem which fell to anesthesiologist Dr. James Epps. He had listened to Jordan's speech on black voting at the Marriott Inn several hours earlier (Towles missed it because he had burn unit duty at another hospital). Epps has been under stress before, including Vietnam, Towles said. You want someone who knows exactly what to do. Towles was called on to treat Jordan partly because he was blackÃ¢Â€Â”local officials "were afraid of racial repercussions," Epps admitted. Yet nobody disputed that he was as good a trauma (or injury) surgeon as there is in Fort Wayne. The 6'3", 215-pound Towles proved to be as adroit handling reporters after the operation. "He fussed and fumed about talking to the press but he did a beautiful job," one hospital executive said. I was appalled that the violence had happened in this town, Towles says. It isn't the kind of place where they burn a cross on your lawn. Towles has practiced in Fort Wayne (pop. 182,000) for 16 years. He's a coalminers son from Pike County, Ky., where his mother helped support the family by keeping house for a white doctor who lured Jeffrey and his sister, now a nurse, into medicine. When I helped clean his office, Towles recalls, I read his medical books. After West Virginia State College, Towles served as an artillery lieutenant in Korea, then dug coal in Pike County to pay for a masters degree at the University of Kentucky. 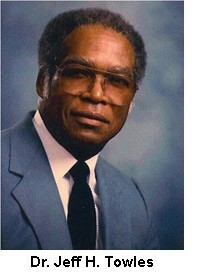 He graduated from the University of Louisville School of Medicine in 1958. In Fort Wayne, Towles has involved himself in community racial issues. He opposed both closing of inner-city elementary schools and busing young black children to white neighborhoods. Towles, who is divorced, works a 75-hour week, but can always be reached by his three daughters on his pocket radio page. (Aged 10 to 21, they live with their mother.) His practice is general surgery, and he prefers appendectomies to gunshot wounds, which seem to happen to people who don't always pay their bills. Towles has kept in close touch with his distinguished patient's progress. On June 12 he accompanied Jordan to New York Hospital, where he is still being treated for infection. The two men still chat by telephone. Jeff Towles saved my life, says Jordan. He is a tremendously gifted doctor who really cares about people and I will be eternally thankful he was there when I went into the operating room.